Remembering with tears. Honouring with laughter. Yesterday the world lost another beautiful child as a result of CMV, cytomegalovirus. This is the same virus that damaged my son Brendan Bjorn’s brain in utero. Her name was Sami, she was 8 years old, and I had known her since she was just 14 months old. I started this blog 4 years ago in part because I wanted to share with the world what it is like to be on this journey of life with a child who has a life-limiting condition. Yesterday was a painfully stark reminder that, despite going day to day focusing on life in the moment, there is indeed a day like this ahead for my own family. It is that fact of this often cruel life which has me shaking since I heard the news of Sami’s passing. I remember the first time I met Sami. It was at the 2011 family gathering (called Making Tracks) for those of us with children affected by congenital CMV. The CMV Foundation, which I had established and ran, held this annual gathering so we could all connect, learn and share. So there I was standing at the hotel room door talking to Sami’s mother, Richelle, when Sami – who was laying on the bed – went into what’s known as an infantile spasm. Instinct kicked in and manners went out the door as I walked straight over to Sami and rolled her onto her side to help her ground herself in her surroundings. (You may or may not know what I mean, and that’s ok). From that moment on, the bond was there with both Sami and Richelle. Having a child with a life-limiting condition is the ultimate in what is not fair about life. It is not the proper order of how life should unfold. Yet, here we are: A precious little girl has gained her angel wings while my son…her beloved friend for years…manages to hang on, his lessons for us not yet complete. I do believe children like Sami and Brendan are here to teach. It is not our job to teach them, for what we can learn from them is far more valuable than anything we might hope to teach. As such, I have come to realise that one of the saddest parts about this journey is when other people aren’t open to learning what our special children are here to convey: Unconditional love, acceptance, and truly understanding the gift that life is. This is an indescribably hard journey and I am still learning. Brendan Bjorn will continue to teach me. The journey with a child who has a life-limiting condition is hard to fathom for those outside of this path. Signing a DNR (do not resuscitate) form on the child you brought into the world. Choosing the song to be played at your child’s funeral years before it happens…because you don’t know when it will happen. Fighting tooth and nail on a daily basis to keep your child alive, to give your child the best life possible, knowing how it all will end one day, some day, some unknown devastating day that could be tomorrow or could be 5 years from now, no matter what you do. And for some of our families, making the hardest decision imaginable deciding to transition your child into hospice level care rather than continuing on struggling with illness, seizures, surgeries, hospitalisations and pain. Last night, I put my head on Brendan Bjorn’s chest and I cried uncontrollably. Truth be told, he laughed at me while I cried, but that’s part of his beauty. He made me smile as I told him about Sami having gained her angel wings. I shared memories with him. More smiles. More laughter. I think that is how Sami would like it to be as we remember her. Fly high, angel. Fly high. Today marks one month since the boys and I moved into our forever home suitable for Brendan Bjorn’s complex care needs. I don’t think it has quite sunken in to my mind yet as I’m kept so busy still trying to unpack, clean, care, and simply be. It’s been 4 months since Brendan Bjorn had his life-saving spinal fusion. However, he remains bedridden and unable to venture outside of his home because he is now on another waitlist, this time for a new custom moulded wheelchair seat suited for his new shape post surgery. His pressure sore has finally healed over as of a few days ago. Now it’s waiting for the seating that will enable him to experience the world outside of his bungalow. No child should have to wait for such a required healthcare item. As I sit here taking a break between duties to write these thoughts, I considered my own history of moving from one house or town to another. By the time I was 5 years old, I had lived in 4 different houses in 3 different towns due to my dad’s job. By the time I was 10 years old, I had moved again, now a total of 5 different houses by that age. I don’t know if that’s an unusual amount of moving because that’s just my reality. It is just the way it happened. By the time Brendan Bjorn was 10, we had moved house 8 time…and that fact breaks my heart. Even so, today I take such comfort in knowing the moving stops here and now. This is it. This will thankfully be the last home he will know. This will also be the home where he will, some year, pass away and leave Declan and I surrounded by the most beautiful, loving memories of the boy we both so deeply love and admire. And as I look around at this moment, that realisation fills me with a peace that is indescribable and likely only silently, innately understood by other parents who are on this journey with their own precious child. One month on and no more moving. A place of new beginnings. A place for life and love. What an amazing feeling of contentment having this home brings to me. This morning while I was giving my son, Brendan Bjorn, a bed bath and a shave, my mind once again wandered into the thoughts of being a full time carer. I trimmed his nose hairs oh so carefully. Yep, it needs done. He has thick, dark body hair and can’t blow his nose, so I need to keep his nasal passages as clear as possible. I also did some manscaping, as they call it. Yep again, it needs to be done. And again, he has thick, dark body hair and as a fully, doubly incontinent young man in nappies 24/7, it is the best way to keep that area clean when he passes what is always very loose stool. Is that too much to write? Is that too much for you to read? That’s just reality sans the sugar coating. It may not be your reality, but for so many of us who have become more than solely parents, it is our reality. I know men who care for their adult daughters during their menstrual cycle, just as I care for my young man with his more personal care needs. Make no mistake, this is reality. In my advocacy work for disabled children (of all ages) and family carer rights, I’ve been told on more than one occasion that the work carers like me do is merely being a parent. Is it? As I cleaned, trimmed, clipped, and cared for my beautiful, precious son this morning, I thought a lot about that statement. First off, no, I don’t agree with it. Having said that, when we decide to have a child, there is no guarantee that dream of the healthy baby being born will be the reality. It is always a gamble, a risk, that it won’t happen the way we hope, and I think anyone entering into parenthood should understand those risks and be ready to adapt, just in case life has other plans than the dreams of the pending parent. BUT…being a full time carer is vastly different than being a parent to a typically healthy child. I think we need more discussions on how to treat parent carers. There are questions to be asked; reforms to be made. 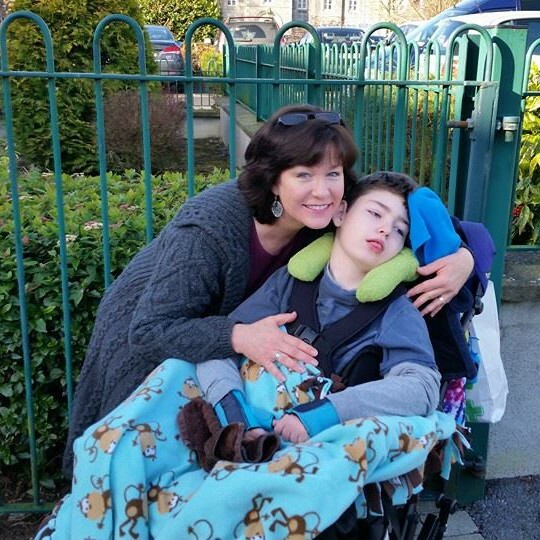 Should the parent of the child who needs full time care due to severe disabilities have to give up everything when crossing into that grey area from parent to carer? Surely there are other ways that the parent can continue contributing to society and their family with working full time, if that’s what they choose. Why can’t the parent carer be supported with home nursing or nursing in a daycare centre while they are out maintaining their career, their social life, their life as the person they once were before becoming *just a carer* who had to leave themselves behind so to care? Would the government (as some do in other countries) not see that it is to their benefit as well to support an active, contributing, member of society via nursing care during work hours? More jobs. More income. More taxes coming in. Less social welfare. It just might also result in carer parents who would have less struggles with depression and physical health issues related to being confined to home caring 24/7, which would in turn also save money from the public purse down the road. As I float unseen in that grey area between being a parent and a carer, having left my former self behind, it all seems so achievable and logical to me. I wonder if it is?